Learn how to make meetha sattu, a delicious, nutritious drink prepared with roasted chana flour. Loaded with protein, fibre and serves as body coolant. 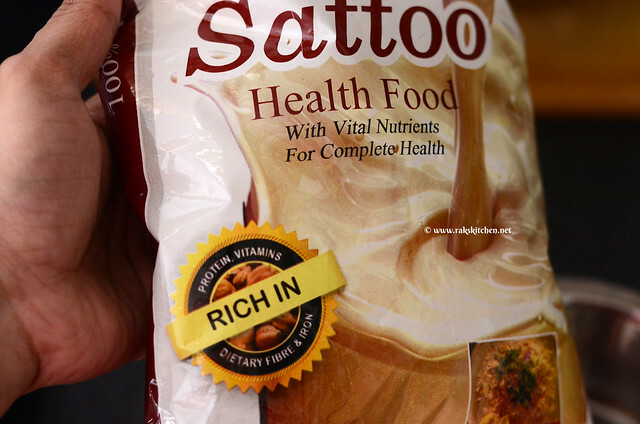 I bought sattu flour by mistake thinking it is sathu mavu which we prepare with multigrains. Later realised it is different, yet it is very healthy. I love sattu namkeen sharbat, paratha and Aj, Vj loves sattu ladoo. A reader asked if I know this meetha sattu drink, I had no clue if there was a sweet version. But she told she tried herself and shared it. I bought a pack of sattu recently, so thought of trying it out. It is simple to prepare and instant energy with lot of goodness. I have used nattu sakkarai (Unrefined cane sugar), you can use any sugar or powdered jaggery (Gur) too. Take sattu flour, sugar, black salt and cumin seeds powder in a bowl. Add 1 cup cold water to it and mix thoroughly until sugar dissolves. Make sure to use jaggery in powdered form to ensure it dissolves easily. My husband likes to taste different varieties. I use your recipe. It is perfect for a new cook like me. Thank you so much.